The Walking Dead Season 5, Episode 12 Watch: Is This Too Good To Be True? The Walking Dead is down to its last handful of episodes for the remainder of Season 5. Whatever's about to go down, should begin the down-going process right about now. Tonight's "Remember" episode felt like the start of that, as Rick and his group arrived at Alexandria. It's really hard to take anything at face value on this series, especially seemingly perfect little communities where newcomers are welcomed. Because Woodbury. Also Terminus. If anything, it's the places that are a bit harder to settle into -- the prison, Herschel's house -- that prove to be better temporary shelters than the ones that seem too good to be true. Alexandria, with all its running water, video games and disposable razors, seems too good to be true. The optimist in me wants to see Alexandria as a necessary oasis through which Rick and his people can pass and shed the weight of their weaponry for a little while. Perhaps, just long enough for them to reconnect with their own humanity. Long enough for Rick to shave his beard, wash off all the Grime and step back into his sheriff gear a bit and remember the man he used to be. These people have been through a lot, and I think Glenn put it best when he said they were out there almost too long. The need a breather. Alexandria could be that. Use of Deanna's camera made "Remember" feel like a post-series episode, where the characters were removed from their horrible situation and interviewed to explain what and why and how. Their filthy, exhausted appearances contrasted drastically from the otherwise cozy and colorful backdrop of Deanna's living room. These Alexandria people have running water and laundry and food. They haven't been completely cut off from the horrors of the outside world. Walkers are everywhere outside the walls. But they haven't been through what Rick's people have. They don't fully understand how bad it's gotten out there. Alexandria's seeming leader, Deanna, appears to have things set up pretty nicely. Why is she putting the whole community at risk by inviting a bunch of outsiders inside the walls? It's a major risk. Are they that desperate for people with better survival skills that they'd take a chance on a bunch of strangers? There has to be more to this. But Deanna does seem to be a calculating woman, and someone who believes herself to be a good judge of character. Maybe she sees the benefit of having real survivors in their midst. 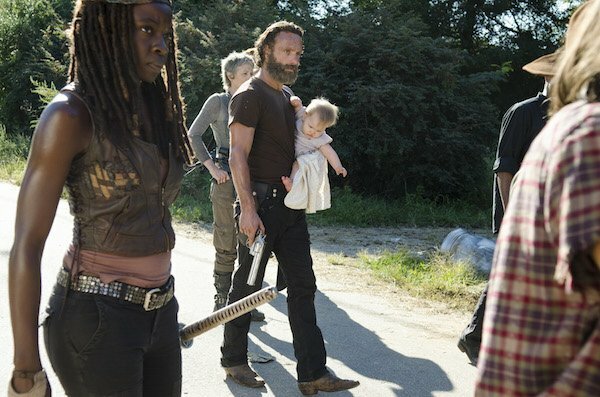 Maybe she sees the benefit of being a part of Rick's "family." Maybe she recognizes that her own community is weak and if they're discovered, it's just a matter of time before some group tries to take over. Or maybe there's something we aren't seeing just yet. What's especially interesting is seeing how Rick and his people are responding to their new surroundings. They have houses, but they'd prefer to huddle up together in a living room. Carl barely knows how to talk to kids his own age. And Daryl refuses to shower. Daryl seems to like to wear his armor on the outside, as opposed to say Carol, who wins major points tonight, not only for her sensible cardigan, but for being able to speak so fondly of her abusive husband, as though her life was perfect before, and she's eager to get back to that. Carol is clearly playing her cards close to the vest. (Daryl is just refusing to wash his.) But I'm curious to know if Deanna sees through Carol's gun-fumbling nice-lady act or not. The episode built up to a mild altercation between Glenn and some of the Alexandrians, but these guys are either putting on a big show of being weak, or they really have no idea what they're up against, as Glenn and Daryl had no trouble taking them down. It was that fight that caused Deanna to step up and flat-out state that Rick and his people are a part of this group now and equals. From there, she gave Rick his figurative sheriff's badge, which is where I think things get very interesting. I don't know if Alexandria's poised to fall. I don't know if there's some big reveal to come for this place. But I do find it extremely interesting that it only took one episode to turn Rick back into his old self... at least, on the outside. We all know Andrew Lincoln's character is not the same guy he used to be. What kind of law enforcer will new Rick be? It looks like we'll find out. In the meantime, guards are most definitely up. Are there any villains among these people? Or is this really a break between big bads? That remains to be seen. But this whole situation seems too good to be true. And what happened to Rick's gun? Side-note: For an episode that was short on zombies, "Remember" offered one of the series' grossest zombie-kills to date, as we got to see Tara peel the skin off the back of one walker roamer. I imagine the definition of disgusting has been drastically altered for any person who's had that kind of skin to peeling-skin contact with a walking corpse. Four more episodes of The Walking Dead Season 5 left.